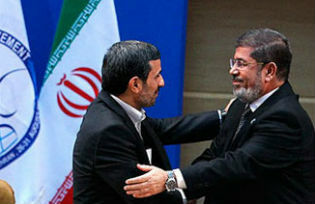 It is still a mystery why President Morsi of Egypt has begun a rapprochement with Iran, a country with which it has little in common, given the country's poor reputation in the Middle East and the mutual suspicion that exists along the Sunni-Shiite divide. Among members of the Gulf Cooperation Council, there has been a mixed reaction to this loose alliance. As an act of reassurance, former Egyptian foreign minister, and current Secretary General of the Arab League, Nabil Al-Arabi said: “Relations with Iran won’t be at the expense of Egypt’s relations with the Arab Gulf, or [at the] expense of [Gulf states’] security and stability.” While Saudi Arabia has been hesitant to embrace the Muslim Brotherhood, Morsi’s decision to choose Saudi Arabia as his first oversees trip after becoming president, illustrated his determination to maintain friendly relations. Morsi has succeeded in the release of USD 1.5 billion of nearly USD 4 billion of aid and soft loans promised by Saudi Arabia. In July 2011, al-Ahram reported Saudi Foreign Minister Saud al-Faisal said Egypt is “the captain of the Arab world and we care about its stability”. Qatar has also agreed to support Egypt’s currency by giving it $2.5 bn in loans and grants. However according to the Guardian newspaper, Dubai’s police chief Dahi Khalfan Tamim believes that both Iran and Egypt pose a threat: “They both want to export the revolution”. Even though, Morsi announced in his inauguration speech that “we do not interfere in the affairs of other people or nations”, in January, UAE officials arrested at least eleven Egyptians with alleged links to the Muslim Brotherhood. While there is no consensus among GCC members regarding Egypt, there is unanimous concern over the threat Iran poses. The Islamic Republic will try to prove that the Sunni-Shiite divide can be crossed, but its ill-conceived support for Syria and the general suspicion, with which most Egyptians view Iran, along with the loss of both GCC and western support, will inhibit the development of a genuine alliance.